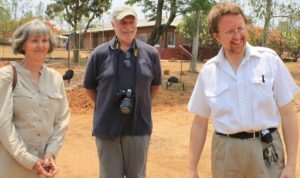 In these pages, Dr. Lowell Schnipper writes about the cancer-prevention work he is doing in Zimbabwe in conjunction with Better Healthcare for Africa. Ms. Hester Hill Schnipper, Dr. Lowell Schnipper and Dr. Paul Thistle at Karanda Mission Hospital. In 2011, Dr. Schnipper, a breast-cancer specialist at Beth Israel Deaconess Medical Center, and his wife, Hester Hill Schnipper, LICSW, BCD, OSW-C, program manager of Oncology Social Work at BIDMC, made a donation to Better Healthcare for Africa in a desire to help improve healthcare at St. Albert’s Mission Hospital. Dr. Schnipper is the Theodore W. and Evelyn G. Berenson Distinguished Professor of Medicine in the Field of Oncology at Harvard Medical School, and the clinical director of BIDMC’s Cancer Center. He is also emeritus chief of the Division of Hematology/Oncology at BIDMC. Following their donation, Dr. Schnipper and Ms. Hill Schnipper expressed an interest in working with BHA to improve cancer-prevention efforts at St. Albert’s and in Zimbabwe. The current cervical-cancer prevention programs at St. Albert’s and, more recently, at Karanda Mission Hospital grew from those conversations and from a proposal developed by Dr. Schnipper in collaboration with BHA. 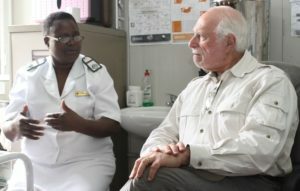 Dr. Lowell Schnipper talking with Mrs. Angeline Bowman, a Registered General Nurse and Midwife, and manager of St. Albert’s Cervical Cancer Prevention Program. A three-year grant to support a cervical-cancer screening and treatment program at Karanda Mission Hospital, Mt. Darwin, Zimbabwe from 2017-19. Dr Schnipper also obtained two generous grants from a private foundation that wishes to remain anonymous. 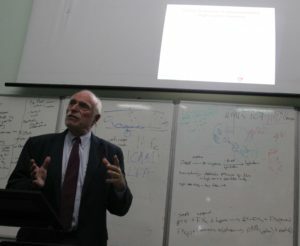 Dr. Lowell Schnipper presenting a seminar to faculty and students at the University of Zimbabwe, 2015. MEC) for St. Albert’s Mission Hospital. It included a complete X-ray department that was critically needed by the hospital, analytical equipment and a fume hood for the hospital’s clinical laboratory equipment, equipment for the rehabilitation department and more. A grant to initiate a cervical-cancer prevention program at Karanda Mission Hospital in 2015. Better Healthcare for Africa thanks Dr. Schnipper and Ms. Hill Schnipper for the time, dedication and hard work they’ve devoted toward reducing suffering and improving healthcare at St. Albert’s and Karanda mission hospitals and in Zimbabwe. Their efforts, with assistance from BHA, are making a significant difference.